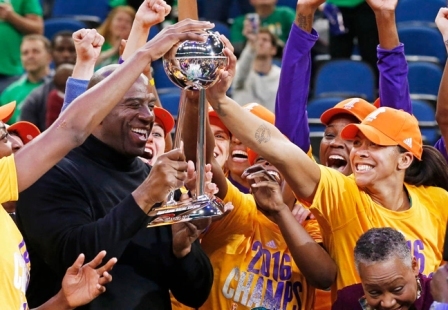 The defending champion Los Angeles Sparks start the season atop The Associated Press WNBA poll. The Sparks received 11 first-place votes from the national media panel Tuesday. Los Angeles opens its season Saturday against Seattle. The Minnesota Lynx, who fell to the Sparks in a decisive Game 5 of the WNBA Finals last fall, garnered the other five first-place votes and came in second in the poll. The Lynx are led by Maya Moore, who was the 16-member panel's choice as preseason player of the year. “I appreciate the confidence expressed in me for this 2017 season, and I hope to bring everything needed for my team to be the best Lynx team yet,” Moore said. Moore highlighted the AP preseason all-WNBA team. She was joined by New York’s Tina Charles, Washington's Elena Delle Donne, reigning AP player of the year Nneka Ogwumike of the Sparks and Phoenix’s Diana Taurasi. New York is third in the poll, followed by Washington, Seattle, Phoenix and Indiana. Atlanta, Dallas, Chicago, Connecticut and San Antonio round out the poll. The Stars are led by top draft pick Kelsey Plum, who was a unanimous choice for preseason rookie of the year. The WNBA tips off its 21st season this weekend. This is the second year the AP is doing a WNBA poll. The first regular-season poll will be released on Tuesday, May 23.